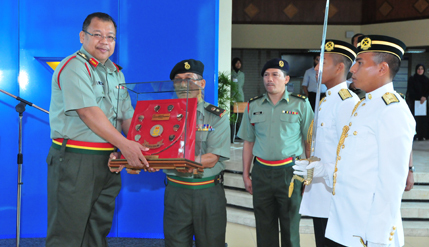 BANGI, 24 September 2014 – The National University of Malaysia’s Reserves Officers Training Unit (ROTU) was judged the best march formation team at the Commissioning Ceremony for reserve officers from public universities (IPTA) held at The Sultan Idris Education University in Tanjung Malim. The UKM team beat teams from 12 other universities which took part in the ceremony held late last month. The champion trophy was later handed over to Vice Chancellor Prof Datuk Dr Noor Azlan Ghazali by UKM ROTU training coach, Lieutenant Kolonel Mohd Safar Said in an official ceremony here recently. Prof Noor Azlan congratulated the team for its achievement that has brought glory to the UKM name. Success by the team showed UKM’s ROTU cadets’ willingness to carry out their training well and able to work together as a team thereby achieving the success, Prof Noor Azlan said.